As the sun shines down upon the garden, many sun-loving flowers emerge and bloom to create a showy landscape presence. Grown in a wide range of shapes, sizes and colors, oftentimes the best flowers for full sun are those that have the ability to withstand drought and heat. They thrive in these poor conditions but without sacrificing their blooms and lush foliage. Tucked along a flowerbed or border, full sun flowers are a staple in the garden. 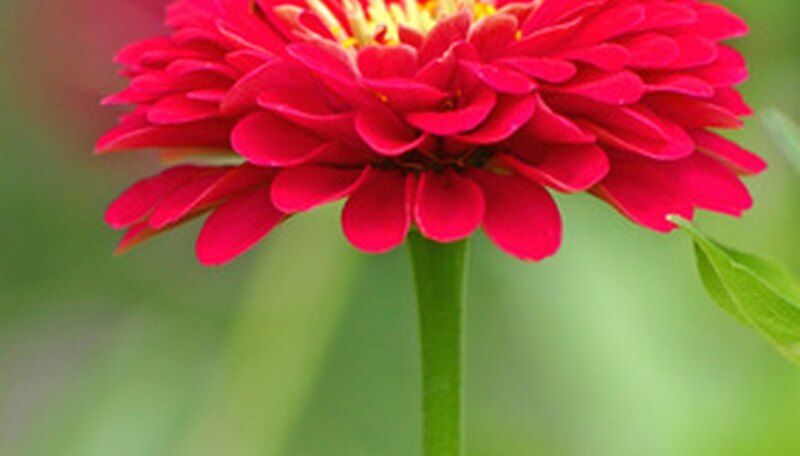 Zinnia (Zinnia elegans) is an annual flower with a moderate growth rate and clumping growth habit. It grows 6 to 36 inches tall and 8 to 12 inches wide, an ideal border flower. The colorful single, semi-double or double flowers of zinnia grow in a wide range of colors–including orange, red, white, yellow and pink–and emerge in late spring and last into early fall. The butterfly-attracting, sun-loving flowers on zinnia are drought-tolerant, creating an ideal flower to flower for the sun. They grow best in full sun and well-drained, fertile soil. To ensure a long-blooming season, deadhead the spent zinnia blooms as soon as they are visible. Zinnia is hardy in all USDA zones. Coneflower (Echinacea 'Art's Pride') is a perennial flower that grows best in USDA zones 3 to 9. It has a clumping growth rate and moderate pace. Coneflowers grow 1 to 3 feet tall and wide and are drought-tolerant to create the best flower for sun. The narrow, fragrant orange-to-copper rays on coneflowers surround the prominent brown central cones or centers that attract birds to the garden. Coneflowers emerge in early summer to last through the season. They have semi-glossy foliage that grows 2 to 3 feet tall. Coneflowers are tolerant of heat and humidity, creating two ideal qualities when grown in the sun. They grow best in well-drained, deep soil but tolerate poor soil conditions. Cosmos (Cosmos spp.) are annual flowers that bloom from spring to early fall, creating a long-lasting growing season. They grow 36 to 72 inches tall and 10 to 12 inches wide and have a clumping growth rate. The cup- or bowl-shaped blooms on cosmos produce masses of butterfly-attracting flowers in pink, purple, white, red and yellow. Cosmos have deep green, deeply dissected, fern-like foliage that helps to create the clumping growth habit. They require full sun only and dry to medium soil moisture, making for an ideal flower to grow within the garden. Plant cosmos in well-drained, fertile soil and deadhead the spent blooms to ensure a long flowering season. Cosmos grow in all USDA zones.